Have you ever been in a long meeting, training, or school lecture, and found yourself falling asleep, or having your mind wander? If so, this most likely happens because the event is boring, and there is a disengagement between you and what is being presented. Similarly, students can find their classrooms boring and feel unmotivated to learn. The National Association of Independent Schools, High School Survey of Student Engagement found that 48% of students don’t find school engaging, and 87% reported that they want to have more classroom interaction. As a kid, and even as an adult, you want to feel entertained and challenged when working on a project or topic. Classroom interaction has the potential to increase student behavior. Material that is best learned through classroom activities increases mastery of tasks, grades, and overall student behavior. When students get to participate in hands-on-learning they are more alert and engaged, making them less likely to disrupt the class. 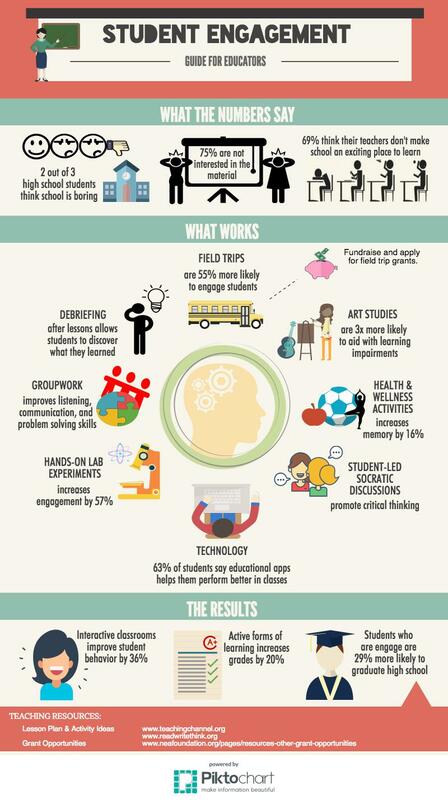 What kind of classroom activities best engage students? Field Trips: Who doesn’t love field trips! Not only are field trips fun, but they can serve as an excellent learning opportunity. For example, you can take children to cultural or art museums to learn history and art. Another example is taking the children to play performances to study literature. Just remember that the best way to ensure an effective learning experience from a field trip is to communicate goals and expectations before the trip, and debrief after the trip to allow students to reflect and apply learning. The Arts: Having an art session during class is also a best practice for engaging students. Whether it be learning to play an instrument, having a musical jam session, or painting and crafting, the arts will keep students entertained. the arts also encourages creativity and promotes problem-solving skills by allowing the students to express their thoughts and emotions better. The arts are more effective in teaching concepts to students with learning impairments, encouraging the students to construct their own understanding, and increase learning confidence. Socratic Discussions: Having student-led Socratic discussions, promotes critical thinking by engaging students in intellectual discourse. Socratic discussion activities are highly active and involves a lot of cooperating. Students get to learn to listen to others points of view and it helps to improve the reasoning process by actively connecting these experiences with their own learning. Group Work: Participating in group projects helps students to develop interpersonal skills like communication, and management skills, while also serving as an alternative form of learning. Group projects help students learn to build relationships and embrace cooperated, and collaborative learning. Classroom engagement is an easy and low-to-no cost alternative to student behavioral management. Not only does student engagement decrease student behavior, but it also increases the chances of the student’s success in the future. Students who are engaged are 29% more likely to graduate high school, and are more likely to make healthier daily life choices. Lastly, engages students tend to have a healthier relationship with their peers and teachers, as well as a more positive outlook on their future. Want to find out more about other activities to keep students engaged as well as get a deeper understanding of the overall benefits? Check out the infographic below. Here are some great sites to help you with your lesson plan activities as well as some gran opportunities to help you fund your next classroom field trip. What are some ways you keep your students engaged? Leave a comment below or join us for our #APYDCHAT April 6, 2017 at 12pm PST/3pm ET to add your voice to the conversation.